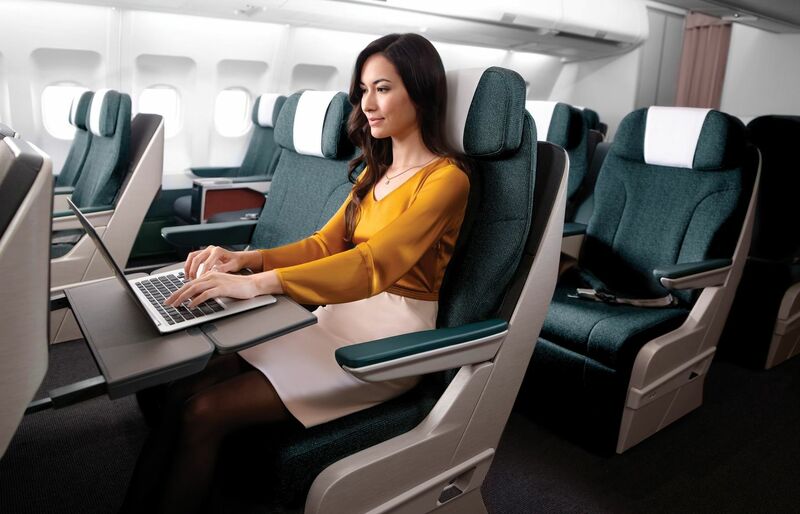 Cathay Pacific has unveiled its new regional business class offering, and it's good news for business travellers: an inch wider, two inches extra space between seats, more recline, at-seat power and more space to work. The seat itself is a new business class hybrid, mixing some elements of an angled lie-flat seat with the recliner that we're used to seeing on Cathay Pacific or domestic Australian business class flights. A "lazy-Z" position is the key here: you're able to recline (slightly more than the old seat) while your feet are supported by the extra-large reclining legrest, which rises up to support your legs. As the airline's then-Head of Product, Alex McGowan explained to Australian Business Traveller a few months ago, the airline has been "taking on board comments from passengers that while they love the service in the region, the hard product is not up to the same standard as the long-haul product." And here's the result -- although we're a little dubious about the amount of room the model has between her and the seat in front, especially when compared with the image below. 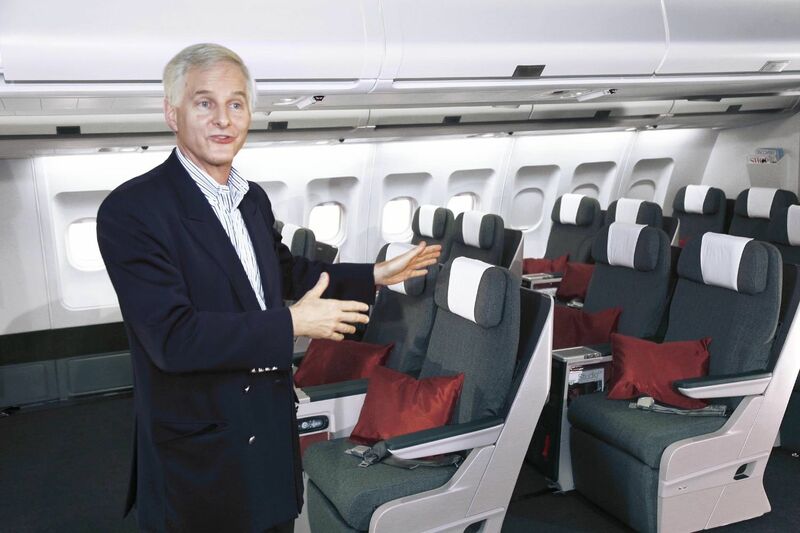 A trick of the lens, or a bit of airline cabin mockup staging? 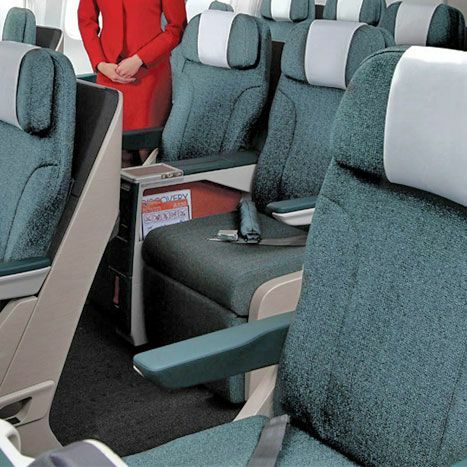 Interestingly, Cathay has drawn on its relatively unpopular old "sliding forwards" economy class seat concept here. The seat has a fixed shell behind it, like an angled lie-flat seat, and slides forward when reclining. Overall, seat pitch has also increased by two inches, to a new total of 47 inches, but we'll be interested to hear feedback from business travellers on whether the new hybrid style seat gives a roomier or more confined sense of space. At 21 inches wide, the seat is fairly generous among other regional business classes, and cleverly sculpted centre and side arms will provide extra space on either side for a bit more elbow-room. 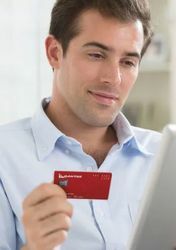 Extra bonuses come from a multi-port connector for your iPhone, iPad or iPod, as well as a USB port to interact with the world-beating StudioCX on-demand entertainment system, which is presented on a 12.1-inch personal TV. Every seat also gets full PC power so that you can keep working (and keep your electronics charged) even on shorter flights like this one. 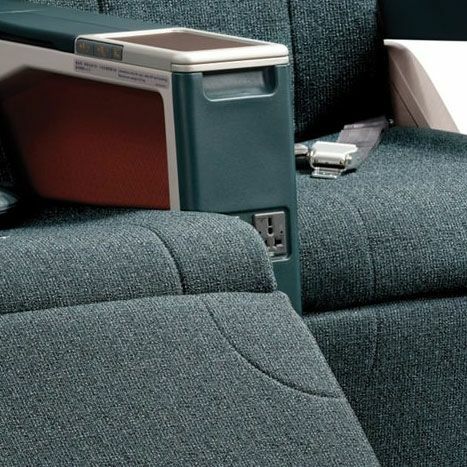 You'll find it between the seats, as a universal AC port. There's also a USB port to provide power. As a bonus, the meal table (which extends from the seat in front of you) has also increased in size, to 20.3 inches wide and 14.5 inches deep. 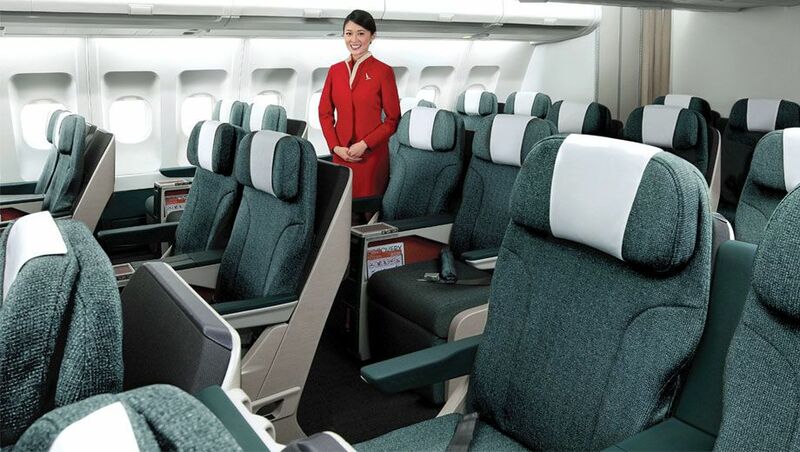 The new seats are the "result of an intensive passenger-led design process involving input from the airline’s Marco Polo Club members to refine comfort, versatility and function," Cathay Pacific says. Now, Australians heading to Hong Kong aren't likely to see these seats on Australian flights, where the rollout of Cathay's fantastic new long-haul business class seat will continue. But on the regional flights where you'd currently see the older recliners, these all-new seats will roll out quickly. 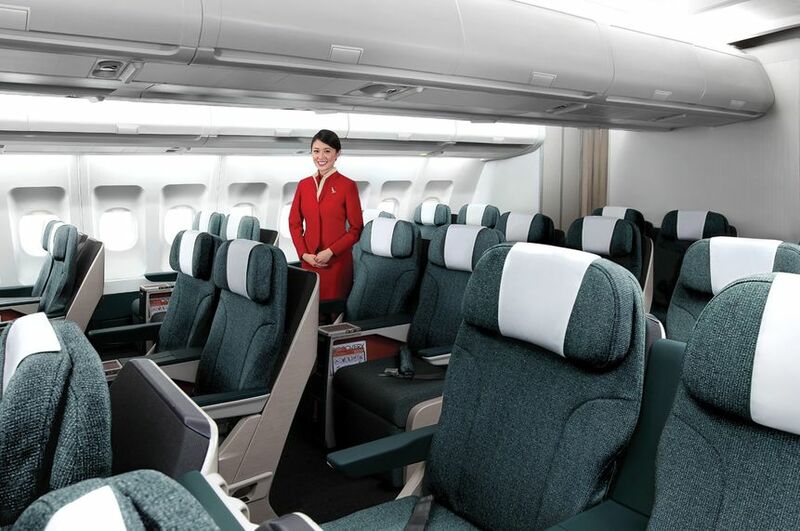 "The new Regional Business Class product will be installed on all of Cathay Pacific’s regional Boeing 777-200/300 and A330-300 aircraft," the airline explains. And rollout is a fast one: "The first Boeing 777 aircraft is due to enter service in January 2013, while the first A330-300 will be completed in the fourth quarter of 2013. All of the airline’s regional aircraft will be fitted with the new product by the end of 2014." For the very latest news on business class seats -- focussed on Australian business travellers' needs -- follow us on Twitter. We're @AusBT. Looks like a brilliant Premium Economy class! Agreed! Overall, I'm not impressed. It looks marginally better than what you'd get on a domestic flight in North America, thought the soft product is obviously miles ahead. Judging based on some rough estimates gleaned from comparing relative positions in the photographs, I would say that the space appears to be sufficient even when fully reclined into the lazy-Z. 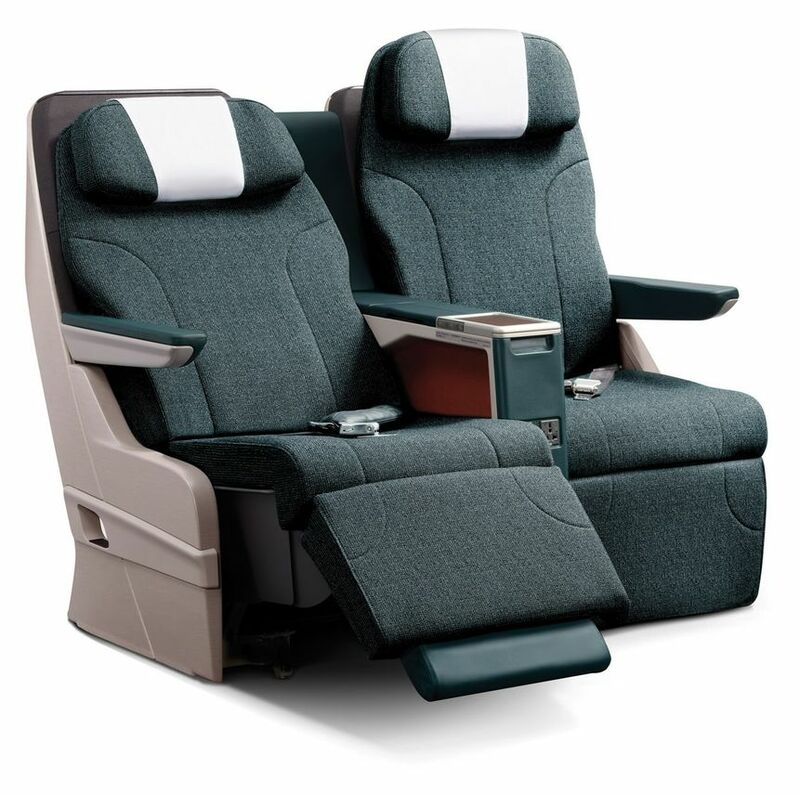 Comment on "FIRST PHOTOS: Cathay Pacific's new regional business class seats"